Do you know more about the Harry Bennett Lodge or what happened there? If so please email parker@michiganpinball.com the information so that that it can be added to this site. Harry Bennett (1892-1979) was the head of the Ford Motor Company "Service" department. This wasn't for servicing automobiles. Instead it was a "Security" department set up top "deal" with the growing labor unrest and the labor unions. Bennett also provided personal protection to Henry Ford and his family. He wasn't on the payroll officially until late in his career. Instead, he was paid personally by Henry Ford in cash and land. Harry Bennett had a "Lodge" built on 2385 acres of land in Michigan's Freeman Township. Freeman Township is in a remote part of central Michigan - Clare, Michigan is the closest city.. 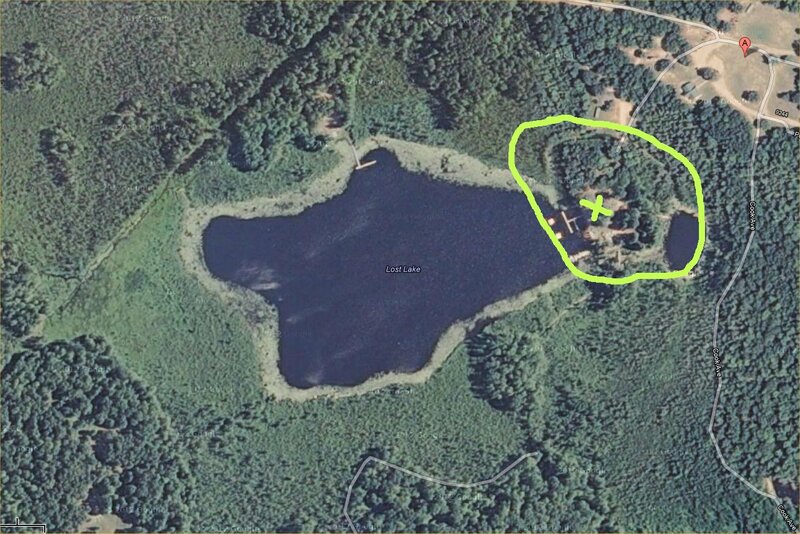 The estate contained 3 lakes, and the lodge was built on the largest of them, Lost Lake. The Boy Scouts of America acquired the land in 1964 for $365,000 from the federal government and ran a Boy Scout summer camp called Lost Lake Scout Reservation. The camp closed at the end of the 2012 season. Harry Bennett was born in Ann Arbor. It is believed Harry grew up as a tough guy. Harry's father died in a brawl when Harry was an infant. Harry Bennett (Left) with Henry Ford (center) and John Corlisle (right) - University of Michigan Photo. Harry started in the Ford art department in 1917. He was later appointed to head watchman. Harry ruled the Ford Rouge Plant with an iron fist. Many people say he had more influence over Henry Ford than Henry Fords own son. Harry was a violent man and was involved in several altercations with the union movement. One such event was the union conflict that occurred at the Ford Rouge Plant in Dearborn, Michigan in 1937, "The Battle of the Overpass." In the 1930s Ford was resisting the union movement. Henry Ford stated that he would never capitulate to the unions. He wanted to stay in control of the company and the workers. He used Harry Bennett to rule by fear and intimidation. Harry hired spies and thugs to staff his "Service Department." The UAW decided to organize a demonstration at the plant to hand out information leaflets. Before it could get started the union people were met by Bennett's security force and were intimidated and beaten. However, the newspaper reporters were already on scene and documented the skirmish. While Ford prevented the demonstration, Ford was losing the battle for public opinion. Three years later the UAW and ford signed a labor agreement. At one time, Harry Bennett was in line to succeed Henry Ford as president but that job went to Henry Ford II. Henry Ford II promptly fired Bennett. Bennett never had gainful employment after Ford. In 1979 he died in a nursing home in California after a heart attack. There is plenty of examples of what Harry's role was at the Ford Motor Company that this page will not go into. If you want to research Harry Bennett more a good place to start it is the Wikipedia entry. Given Harry Bennett's occupation, it is no surprise that he was fearful of an attack from his enemies. He also needed a secure place that law enforcement could not reach. So Harry built two fortress style buildings. One was his residence in Ann Arbor, Michigan and the other a lodge in central Michigan. 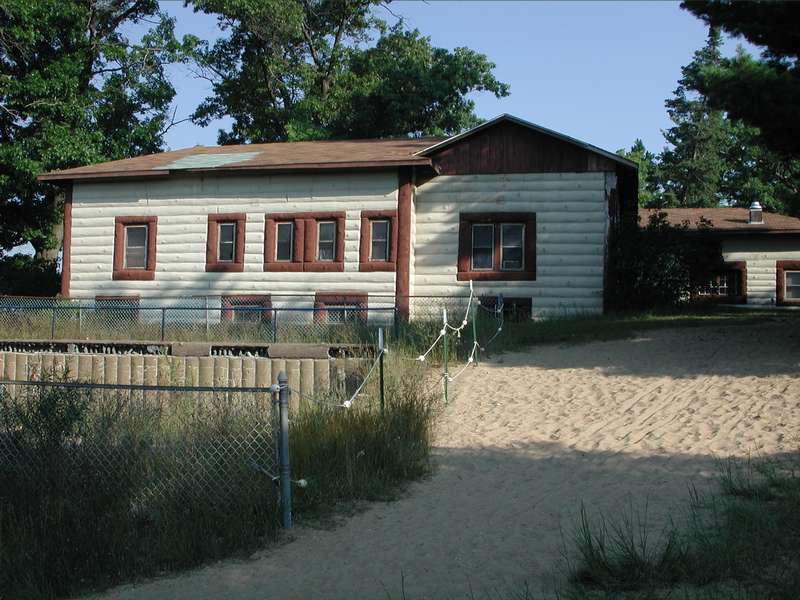 The central Michigan Lodge was actively used by the staff and scouts attending the Lost Lake Scout Reservation. 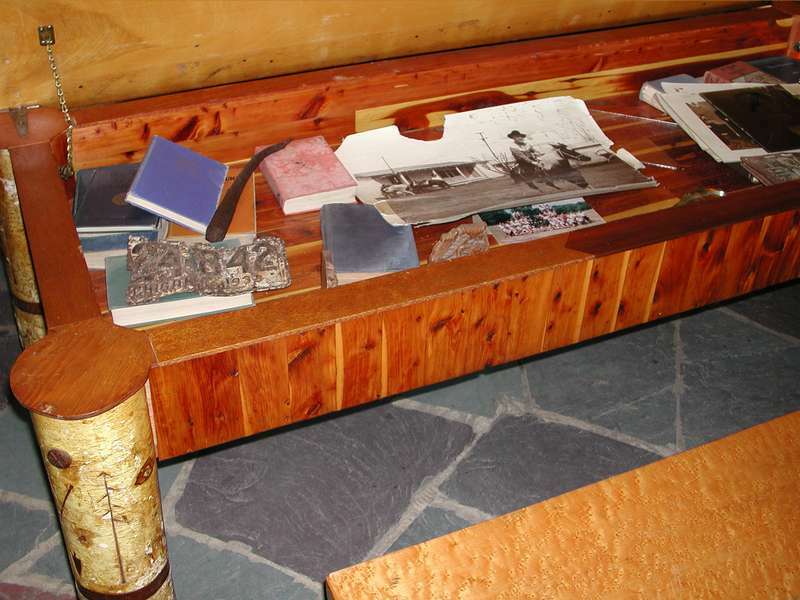 The staff at the camp is somewhat aware of the history of the Lodge and its occupants. 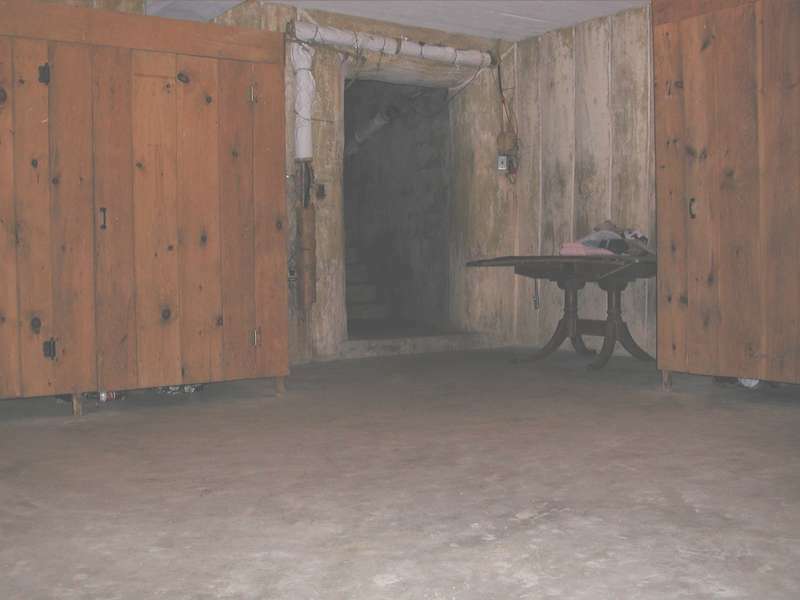 Over time, there have been reports of ghosts and other strange events occurring in or near the lodge. 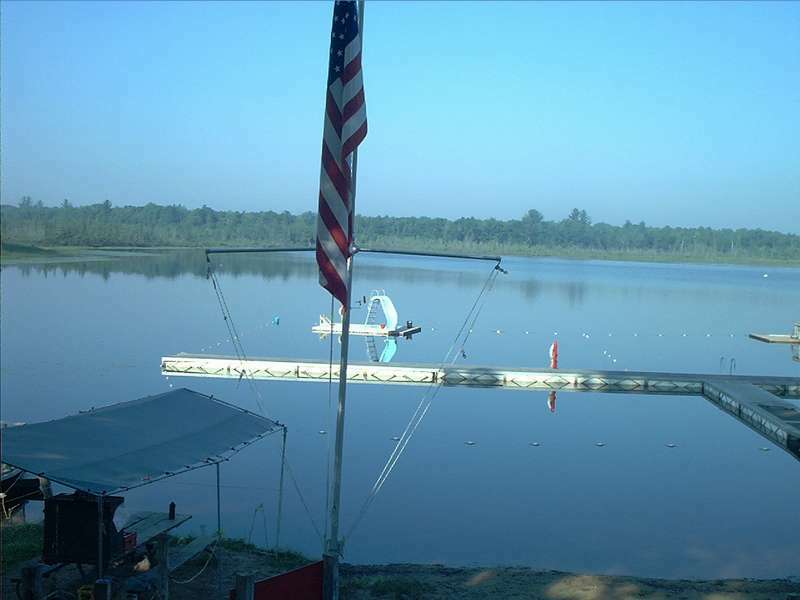 I have been to Lost Lake Scout Reservation (both of my boys attended Lost Lake and are now Eagle Scouts) every year from 2000 to 2011. I was intrigued by the little publicized history of the Lost Lake Scout Reservation and took these pictures in 2002. 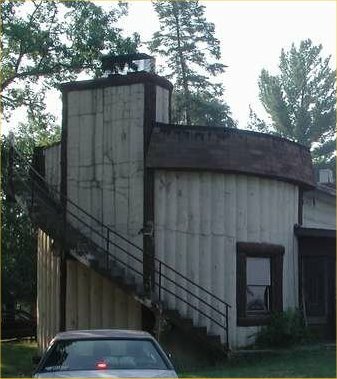 The most unique feature of the Lodge is that it is not what it appears to be. The entire structure appears to be made of logs and wood in typical log cabin style. Picture of South Facing side of Bennett Lodge. But instead of wood, the entire structure is made of concrete. Thick Concrete. And someone spent a lot of time detailing the concrete to look like wood. Close up of Bennett Lodge "concrete cabin"
Yes that is all concrete. 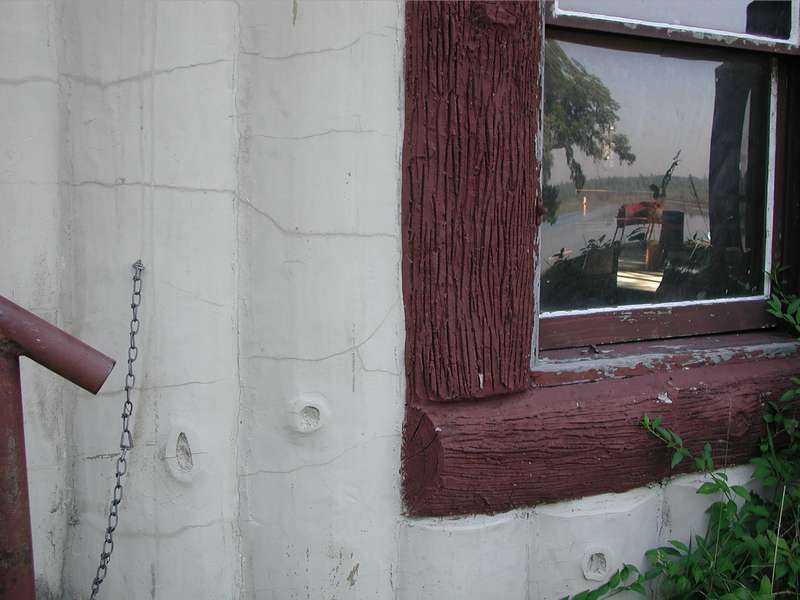 The "knots" were formed in the concrete and "logs" around the window were groove to look like real logs. This is a very large multi-story structure and it was all built with this attention to detail. Picture showing the front of Bennett Lodge. The photo above shows some of the front of the lodge. This is the West facing side and is right on Lost Lake. The large porch off the front is also concrete. Above is the view of Lost Lake from the porch area of the Lodge. Bennett Lodge was and to this day (March 2013) is the only structure on Lost Lake. The area pictured is the swimming area the boy scouts use. So why does someone build a huge concrete structure in the North-woods of Michigan? There are plenty of theories. It certainly makes sense that Harry was concerned for his safety so he may have built it for protection. There are also plenty of stories of wild parties involving prostitutes, thugs, Ford employees, and the Mob. 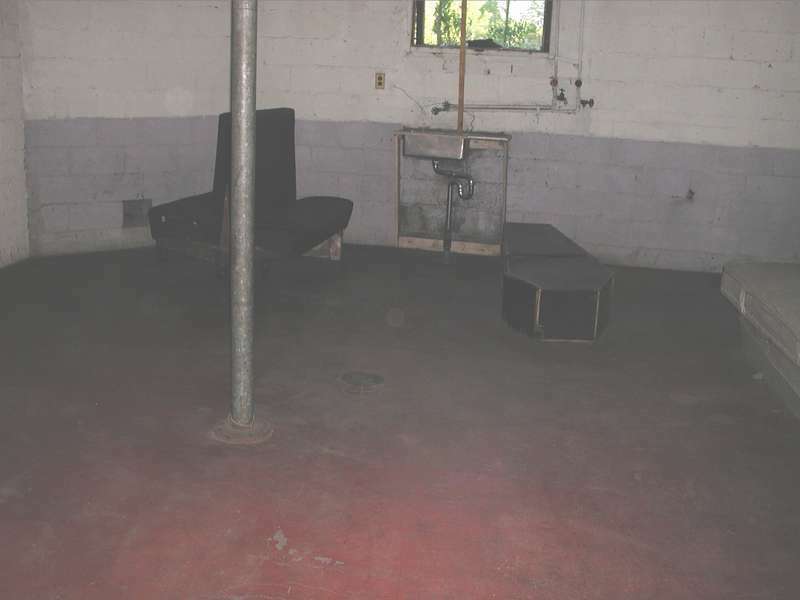 There are theories that people were taken there to be "disposed of." 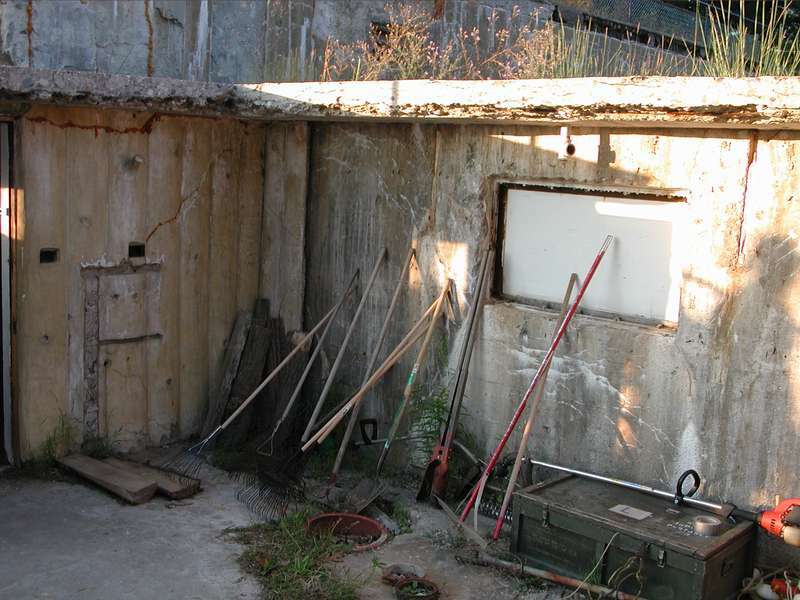 What we do know is that the concrete cabin had some unusual features. We can only guess their purpose but some of the items that I have seen for myself do make you wonder. Who builds a mote? And a Secret Passageway? A machine gun tower? 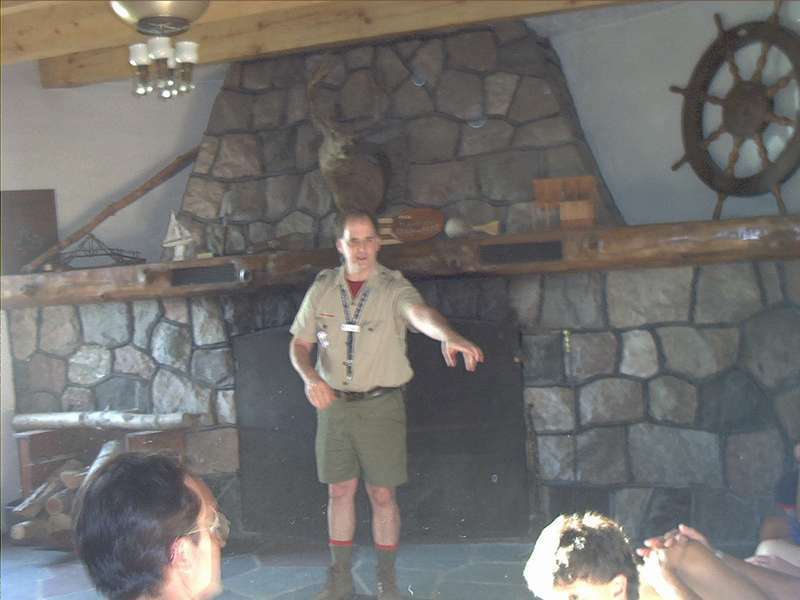 When I was attending Boy Scout Camp with my son the staff offered a tour of the Bennett Lodge. 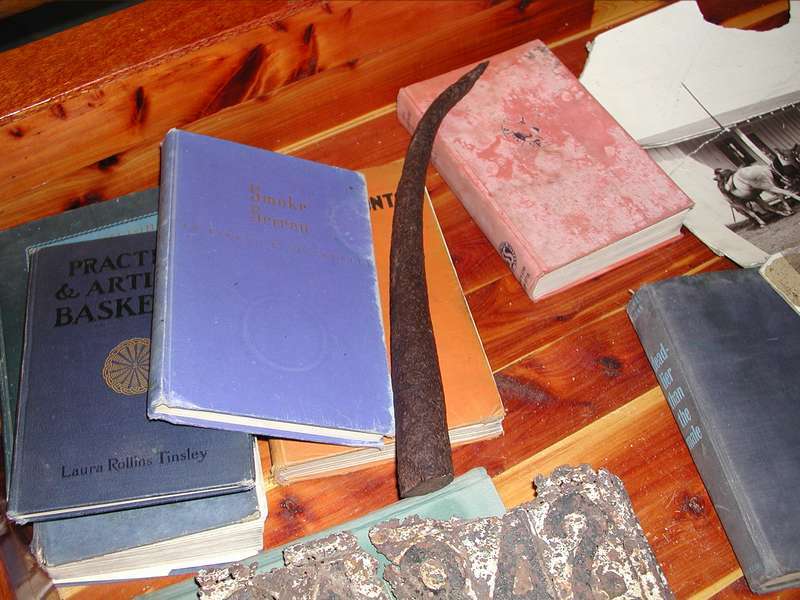 During the tour they would point out some of interesting things about Bennett Lodge and the items in it. Certainly there was some exaggeration occurring to make it more interesting for the young scouts. But some of the things really do make you think about what went on at Bennett Lodge. Lets start with the mote. Yes, there actually is a mote around Bennett Lodge. 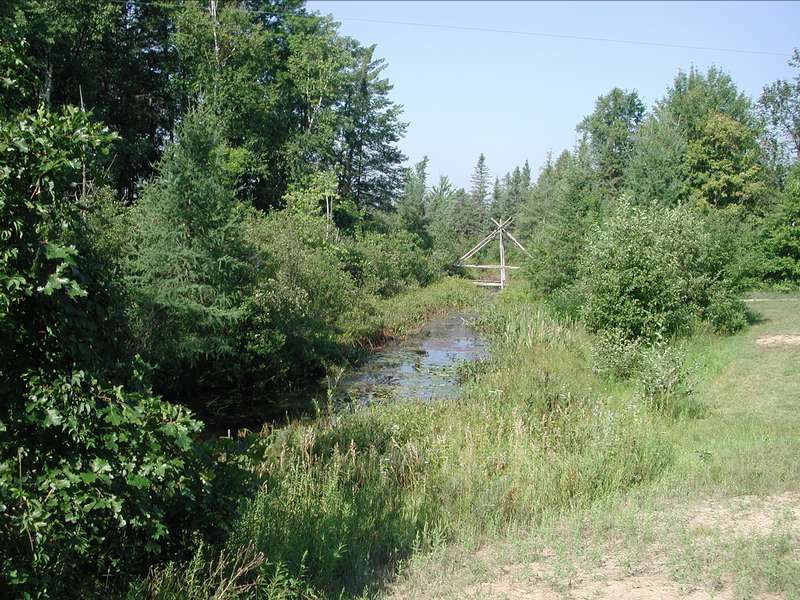 There is a bridge that crosses it for access to the Lodge itself. According to the stories this bridge was rigged with dynamite that could be remotely detonated to prevent a vehicle attack on the compound. Of course there is no way to verify that! But we can see from the Google satellite image that their is a mote. The tree cover obscures it some but there is no doubt about it when you are there looking at it. It definitely appears to be man made. There is no current. The X in the photo above shows the location of Bennett Lodge. The circled area show the mote. The circle is positioned outside the actual mote so you can see the mote itself. On the north side you can see the line pretty clearly. It is harder to see on the south side but there is water there also. It is also believed that the mote was "spiked" with large metal spikes. This was to prevent people or vehicles from crossing the mote. For the safety of the scouts the spikes were removed. During the tour of Bennett Lodge we were shown one of these spikes. Metal Spike from Bennett Lodge mote. Also shows license plate found in lake. According to the scouts tour guide the entire cabin was fitted with 1 inch thick "bullet proof" glass. The scouts removed the thick windows over time and only a few pieces of the glass remain. On the tour I attended they had a piece of the glass but I failed to take a picture of it. Inside the living room is the main fireplace. "Stan the Buffalo Man" talks about Bennett Lodge history. In the photo above Stan is standing in front of the main fireplace inside of the Bennett Lodge living room. Note the nice slate floor and "wood" mantle. The mantle is actually hand painted and hand formed concrete! The slate floor was a two level semicircle design with a custom built-in sofa where the higher floor encompassed the sofa. After the talk we were able to look inside the fireplace. The fireplace is no longer used for heat. Looking inside we could see a wrought iron ladder that was secured to the back of the fireplace. This ladder led up the chimney. The chimney is large enough for person to fit through. At the top of the ladder was a small turret roof. Not sure if I would want to climb the ladder while a fire was going! Above is a picture showing the back side of the chimney. On the roof was a large cement (of course) roof. This is where the machine gun was supposedly mounted. There were iron mounting plates still attached to the top of the roof that looked like it could be for mounting a large machine gun. As you can see the roof could also be accessed from the outside by a spiral staircase. The Lodge came to the Boy Scouts furnished. Over time many items have been discarded but some neat items remain. 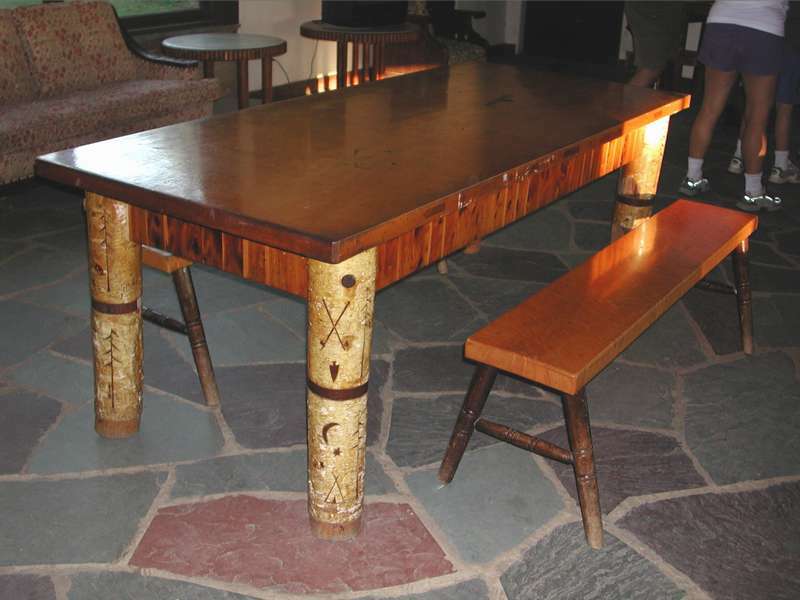 This main table in the living room is one of those. Flip Top table in Harry Bennett Lodge. This table has a hinged top. According to our tour guide, Harry Bennett would store guns under the table top. This way the firepower would be near at hand and his guests would be none the wiser. The lodge had an attached in ground swimming pool. The boy scouts used the pool for many years but over time it developed cracks in the concrete. It was too expensive to repair so they filled it in. They also had to remove some other areas near the swimming pool that were unsafe. The above picture shows the window (white rectangle area) that was installed in the pool. The pool is filled in with dirt now. If you look closely you can see where the ceiling was cut away in this area. At one time this was the bar and the patron's on the bar could sit on their stools and look through the window at the pool. The window was below the water line. Rumor has it that Harry Bennett would hold big parties and they would bring in local girls from town who they would pay to skinny dip in the pool. Supposedly they did not tell the women about the window. If you have a picture of this area before the ceiling was removed or the pool filled in please let me know. Here is a close up view of where the ceiling was cut away. Look at the high aggregate content of that cement! 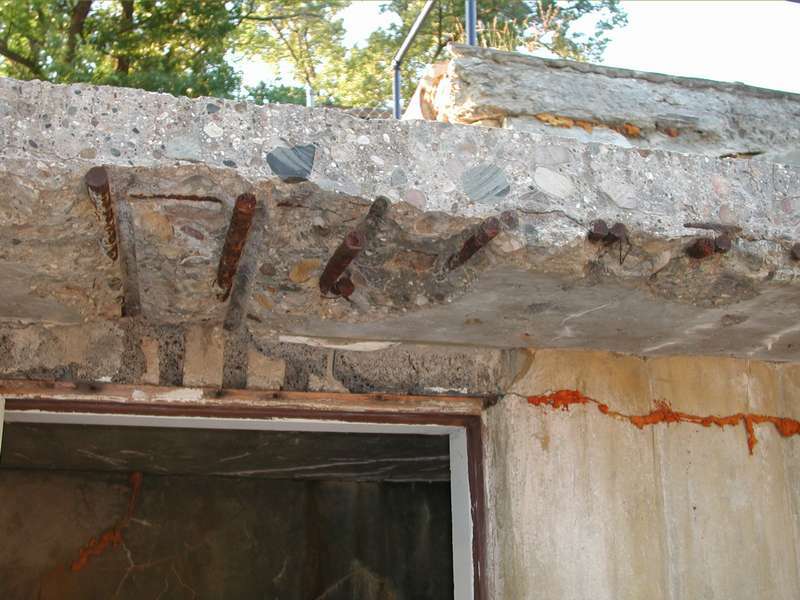 According to the scouts, the contractor who did this work took a huge loss because this concrete was so strong that it was very hard to cut and remove. 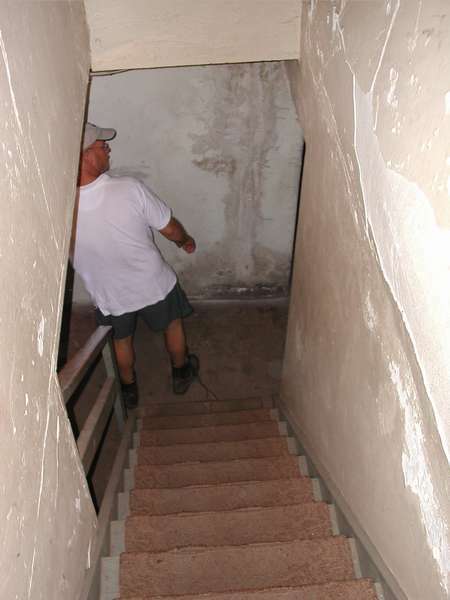 The lodge has a basement level that is accessed by a traditional stairway. There are many rooms in the basement area including a finished library (that we will discuss soon). This room below has a red painted floor. According to our guide this is the original paint and the stories say the this is where victims were taken to be shot. The blood red paint was there to make cleanup easier. Lodge basement floor painted red. Legend has it that Harry Bennett would invite people up to the lodge for parties and vacations but some never returned. They would meet their maker here in the basement. I have heard of secret passages in movies but this is the first one I have seen in real life. And this isn't just a secret room but an actual passage to another area. Scouts going into the secret passage. Here our tour group is going into the passage. As you can sort of make out the library room of the lodge is paneled and has book shelves on the wall. 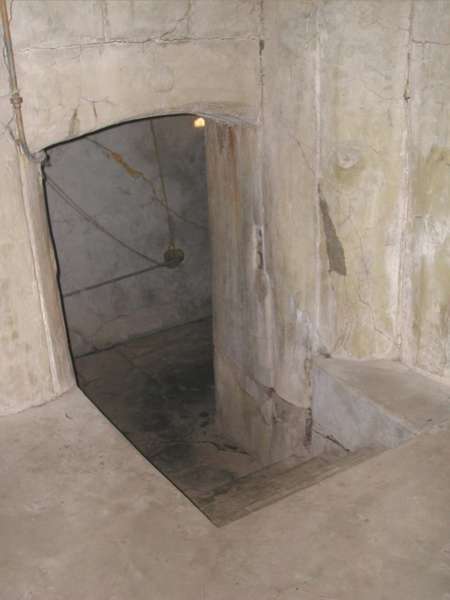 Below is a better picture of the secret passage door half way open. When closed it looked like an ordinary bookshelf. When full of books nobody would know it was there. 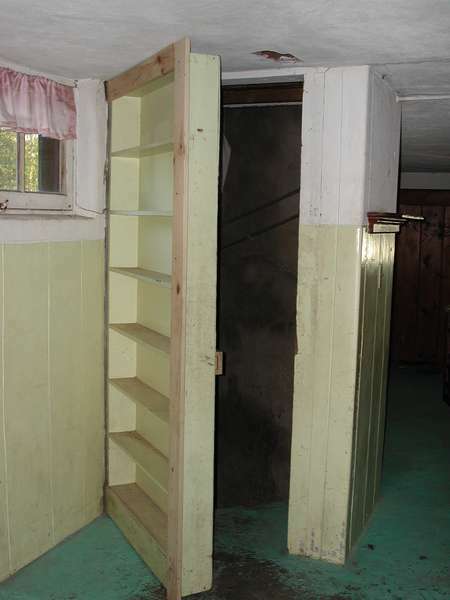 According to a former camper and Eagle Scout when he was there the bookcase was filled with books. About half way up on the far right side, there was a book with a rope attached to it. When the book was pulled, the rope would release a latch that secured the hidden door! Once inside here is what you see. These stairs lead to an underground bunker. Each stair is a different length and some are pitched at odd angles. As you can also see there is no hand rail and no lighting. According to the stories the stairs were made irregular on purpose. Harry Bennett and his henchmen would practice running down these stairs in the dark. People pursuing them would have a difficult time traversing the stairs in the dark and the irregular shapes and angles were designed to cause people unfamiliar with them to fall. 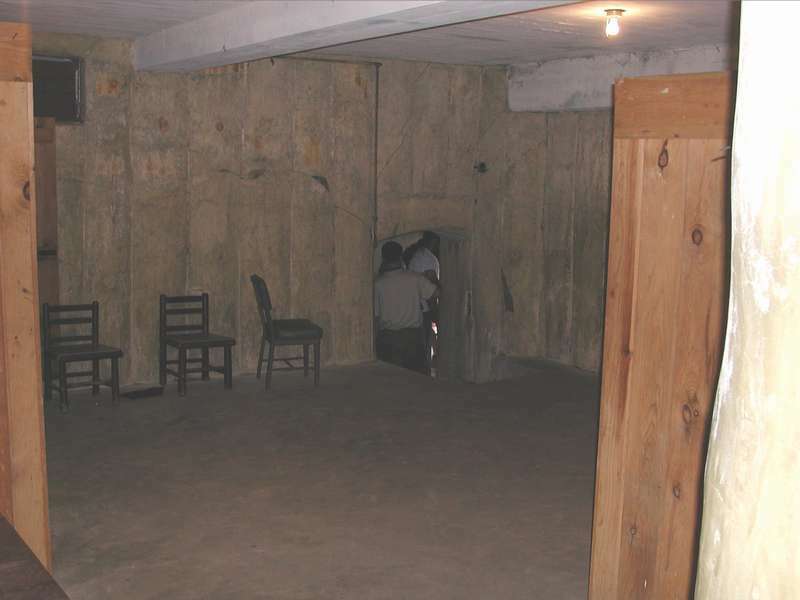 At the bottom of the secret stairway was the underground bunker. This was a story under the basement level. The walls, floor, and ceiling were all made from thick concrete. 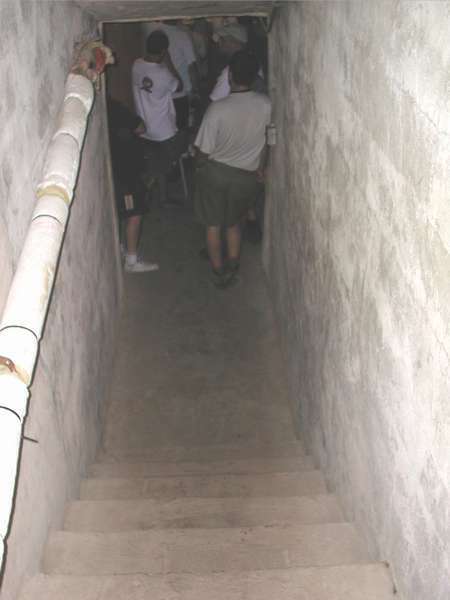 This picture is taken from the bottom of the secret stairway stairs. The people are going out an exit built into the bunker. This exit goes to outside to the moat area on the south side of the lodge. Here, the story is, a speedboat was always waiting so an escape could be made across the lake. Once across the lake there was a car waiting that would take them to the airfield for escape. 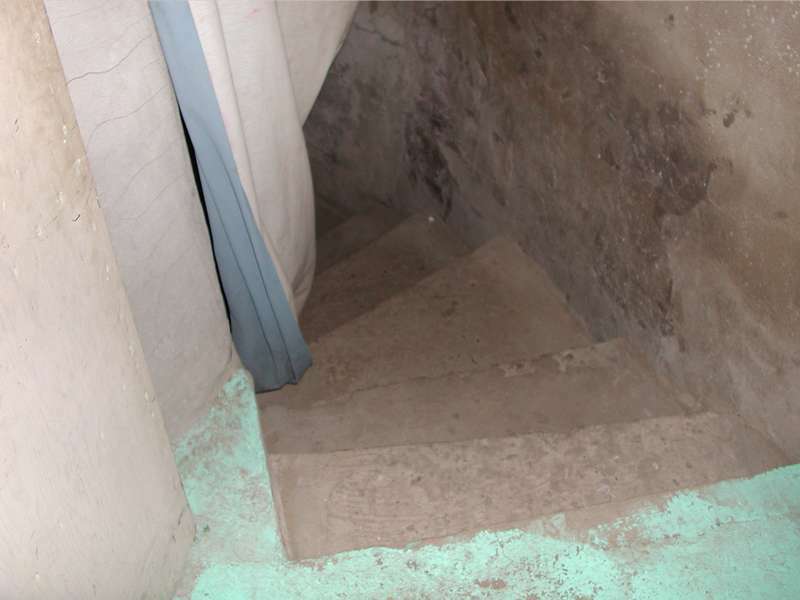 The above photo shows the view from the exit back towards the secret passage stairs. The wooden lockers were added by the scouts. The swimming and boating staff members used this area as a changing room and locker area. Not pictured (I don't think it is there any longer) is a full size mirror that came with the Lodge. On my first tour of the lodge a story was told about "The Lady of Lake" that this mirror was a subject of. This story scared the young scouts enough that I don't think they tell it anymore. Here is a close up of the bunker exit. Enough concrete for ya? 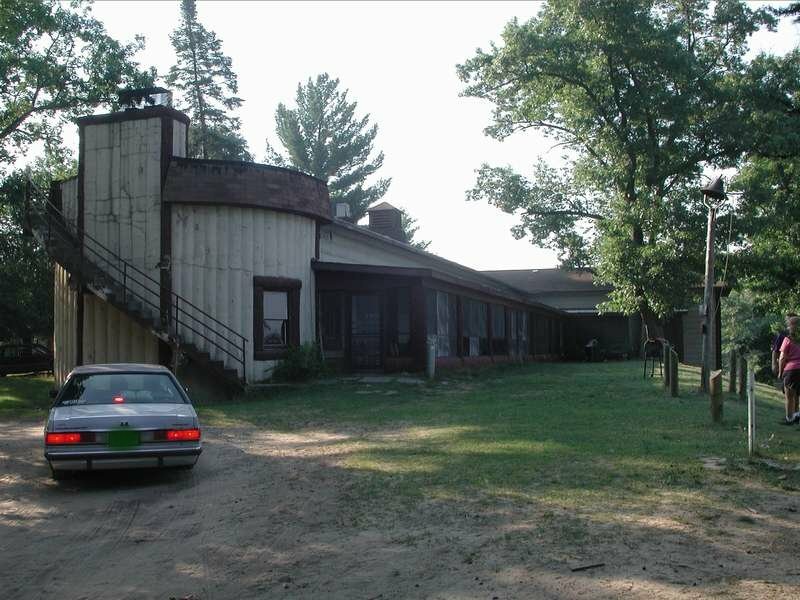 As of this writing (March 2013) the lodge is still standing and in pretty much the same condition as shown in these photos. However, the scouts did struggle with what to do with the Lodge. 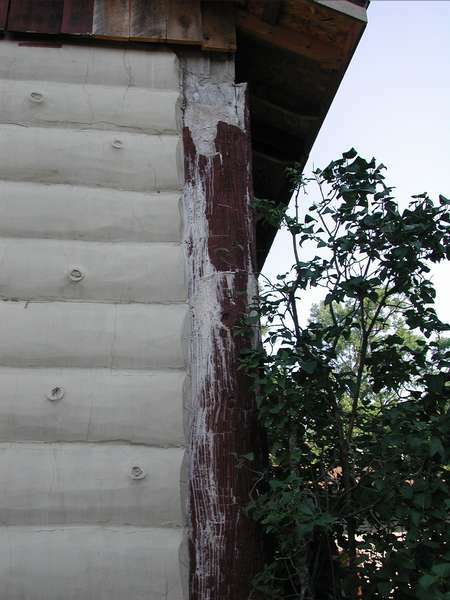 It is a very sturdy structure but does need upkeep and it is very expensive to repair this type of building. Below is a list of some of the stories we know of. If you know more detail or another story please send me an email at parker@michiganpinball.com so it can be added. The Mirror in the Bunker..
License Plates from the Lake. Many bodies went missing at Lost Lake. The Artesian well. There is an Artesian well at the front of the Lodge. The water is clean cool and potable and was used as drinking water by the staff and scouts. I drank from this well many times but last I heard the well had been capped off. The Tunnel. There is rumor that there is a tunnel under the moat to the DeCorcy Lodge. The Airstrip. There is an old airstrip at the central west side of the property. This was actively used by Harry Bennett and others to come and go. The Castle. Harry also built a "castle" in Ann Arbor on the Huron River. The castle was sold in 1948.